Ideal for a quick get away, this duffel has a zippered main compartment with reinforced bottom. A front slip pocket and expandable top provide additional room. 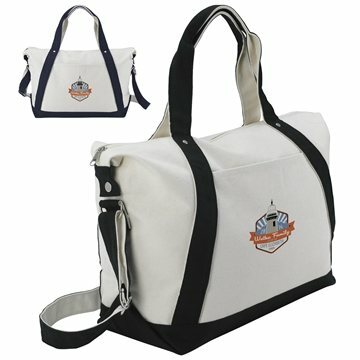 The two-tone adjustable shoulder strap as well as the matching handles, make carrying a breeze. Front pocket for additional storage. Side snap closure providing style and can be release to add additional space. Metal rivet for style and design. the flexibility with the graphic department when displaying the logo and text. I could not ask for anything more. You guys do a good Job! the see-thru design is very useful on drawings and prints. We're very pleased. the product is great, exactly what I expected. Very good! I think the product is perfect. I plan to use it for a big event next year.